A virtual hard drive file is a container file that acts as similar to a physical hard drive. When you perform certain virtual machine management operations, such as creating a virtual disk, cloning a virtual machine to a template, or migrating a virtual machine it can contain an operating system, applications, and data. Virtual hard drive files are attached normally to virtual machines (VMs), and do function as system or data drives for the VM. In this blog we are going to see types of virtual hard disk provisioning methods and difference between of each of the methods. There are three types of hard disk provisioning methods available in VMware. When you try to install the Virtual machine by using ESXi as well as vSphere client you can have an option to choose the following three formats for hard disk provisioning. The following snap will help you to know the option available for provisioning virtual hard disk methods in VMware vSphere client connected to ESXi host. Using this method you can save the storage space. At the time of Virtual machine creation, space required for thin-provisioned virtual disk is allocated and zeroed on demand as space is used. The space unused is available for use by other virtual machines. And it will operate by allocating disk storage space in a flexible manner among multiple users, based on the minimum space required by each user at any given time. Implementing thin provisioning at customer sites can save big money by improving storage utilization rates. Thick Lazy Zeroed provision is used to create a virtual machine (VM) disk in a default thick format and it will reserve the disk space when the VM is created, but that blocks containing older data on the storage device are only cleared when the virtual machine writes new data to the disk for the first time. It is important to note that it is a traditional model of storage provisioning. With thick provisioning, the large amount of storage space is provided in advance of future storage needs. However, the space might remain unused causing wastage of storage capacity. Thick Provisioned Eager Zeroed supports clustering features such as Fault Tolerance. And it occupies all the space that is required for the virtual disk files is reserved when the VM is created, but that hard disk blocks on the physical storage device are formatted with zeros to overwrite any older data. Above diagram will help you to understand the difference between Thick and Thin provisioning. 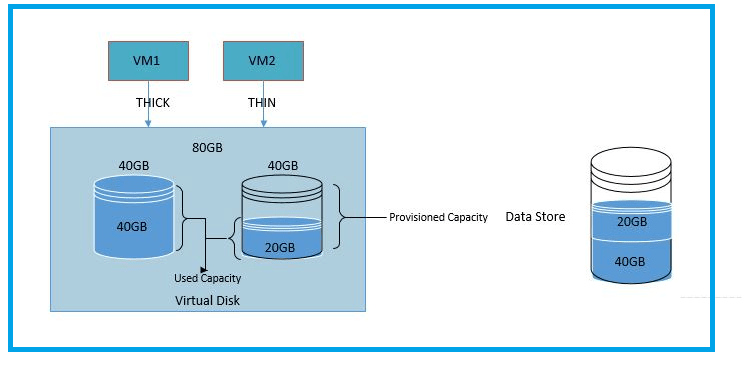 If you provide thick provisioning to any VM, you first need to estimate how much of storage space for the virtual machine will need for its entire life cycle. Then you provide a fixed amount of storage space to its virtual disk in advance, for example, 40GB, and have the entire provisioned space committed to the virtual disk. A virtual disk which immediately occupies the entire provisioned space is called a thick disk. But if we consider thin provisioning for virtual disks, the entire space required for the disk’s current and future activities, for example, 40GB. However, it should be noted that the thin disk commits only as much storage space as the disk needs for its initial operations. In this example, the thin-provisioned disk occupies only 20GB of storage. Remaining space we can you use it to another VM. As the disk requires more space, it can grow into its entire 40GB provisioned space. Above diagram is about difference between Thick Provisioned Eager Zeroed and Thick Provisioned Lazy Zeroed. It will help you to understand the lazy and eager zeroed virtual disk if you create and allocate the 40 GB hard disk space. For lazy zeroed disk initially it occupies the entire space of disk and the blocks containing older data on the storage device are only cleared when the virtual machine writes new data to the disk for the first time. But Eager zeroed disk also occupies the entire space of the disk and the blocks on the physical storage device are formatted with zeros at the time of hard disk provisioning to overwrite any older data. 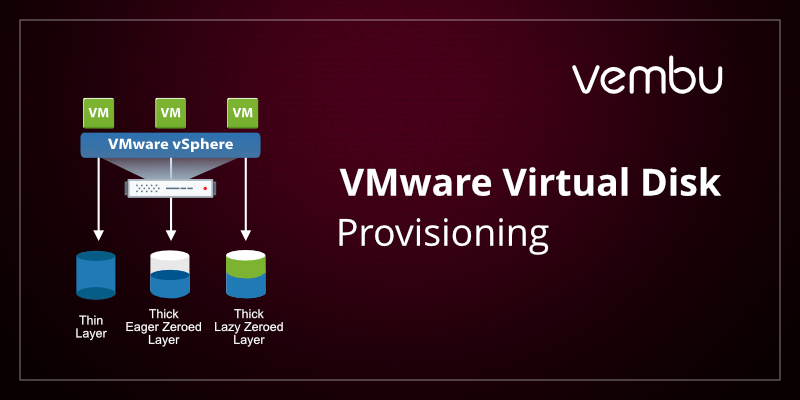 I hope this blog will be useful for understanding about virtual disk provisioning methods in VMware vSphere client tool and it helps you to know the difference between Thick Provisioned Eager Zeroed, Thick Provisioned Lazy Zeroed, Thin provisioned and it clarifies of all your queries about VMware Virtual disk provisioning methods. I am a System Administrator in Vembu Technologies. I like to read and share about new technologies related to networking and virtualization. Nice article Siddik. Gives Better understanding on vmware disk provisioning methods. But my doubt was, How did you verified the default formatting method was Lazy-zeroed ? I tried to found the article. But no luck. The one hint i got was, data fragmentation is there in thin provisioning.It because of on-demand space allocation. Is my conclusion correct siddik? Nice article Siddik. Gives Better understanding of VMware disk provisioning methods. But my doubt was, How did you verify the default formatting method was Lazy-zeroed? Not saying that lazy zeroed method is a default formatting method for Virtual disk provisioning. 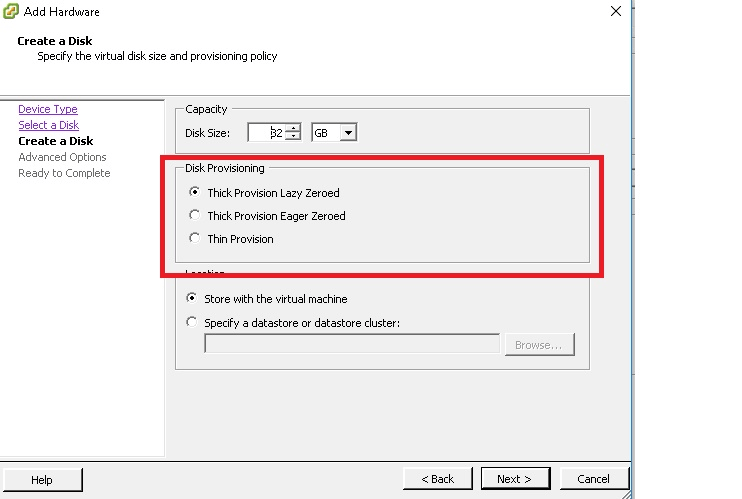 Thick provision lazy zeroed is a provisioning format for a virtual machine (VM) disk that creates a virtual disk in a default thick format.